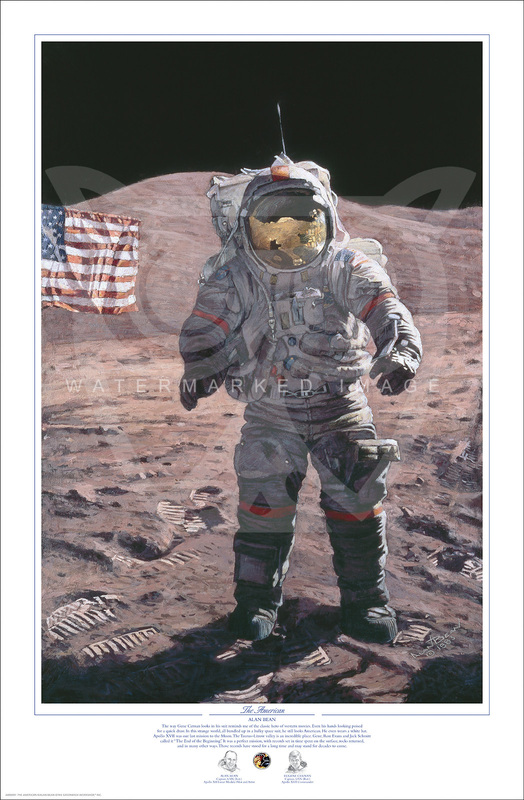 Image Size: 16"w x 24"h.
"The way Gene Cernan looks in his suit reminds me of the classic hero of western movies," says artist/astronaut Alan Bean. "Even his hands looking poised for a quick draw. In this strange world, all bundled up in a bulky space suit, he still looks American. He even wears a white hat. I painted Gene with the Sun almost at his back and his suit almost shadowed. The colors I used were not as literal as they are expressionistic, or impressionistic. It was a beautiful mission to an incredible place - the Taurus-Littrow Valley. 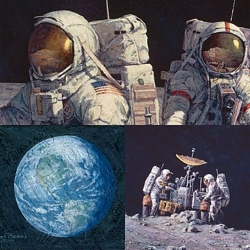 Apollo 17 was our last mission to the Moon. Gene, Ron Evans, and Jack Schmitt called it "The End of the Beginning". It was a perfect mission, with records set in time spent of the surface, rocks returned, and in many other ways. Those records have stood for a long time and may stand for decades to come. I have special admiration for Gene. We were in the same group of fourteen astronauts selected by NASA in 1963. We were all about equal in experience and potential, but Gene worked harder and developed more; and, by the time we left NASA, he was easily one of the very best.